Writing a book—unlike creating a website, learning to love, saving money, mowing grass, and most other things in life—has a finish line. At some point, you stop writing and editing, and hand over the book to be published. It’s in paper-and-ink concrete. There’s something satisfying in that, especially the moment you crack open that box and hold the first copy of your book in your hands. Like a conversation that didn’t quite go right, you think about all the things you wish you’d said. Or not said. Or said better. 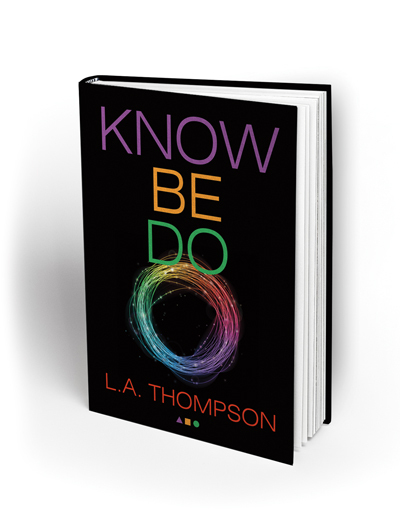 I’ve thought a lot about what a second edition of Know Be Do would say (if I ever sold the four leftover boxes of books still in my storage room!). Sure, I’d correct the 11 typos on my growing list of errata. But there’s one major concept that I’ve discovered since I published Know Be Do, a principle so important I wish I could add a chapter to every copy of the book. Just as God progressively revealed the steps of Know Be Do to me one level at a time—Do, then Be, then Know—God has shown me in the time since publishing the book that Know, Be, and Do are not levels at all. They are not steps. They are not sequential. They are interrelated. Let me explain. The basic premise of Know Be Do: Turning the Christian Life Right Side Up (available at Amazon) is that most people are living the Christian life upside down—and they don’t even realize it. They define the Christian life by what they do and don’t do. It leads to a life of frustration, futility, and failure. Know Be Do turns that around and emphasizes that the Christian life begins not with Do, but with Know. Start by intimately, biblically getting to Know God. Once you see Who He is, you’ll understand who you are in Him (Be). And once you accept and employ your position in Christ, then Do comes quite naturally—supernaturally actually. No more striving and struggling. No more flailing and failing. Start with Know, then Be, then Do. And I still believe that’s totally true and essential. But the story doesn’t stop there. The process is not not linear. It’s circular. Do isn’t the finale. It’s the prelude to knowing God even more intimately. Know feeds Be. Be feeds Do. And Do in turn feeds Know, starting the cycle again. Even as I wrote Know Be Do I feared that I was undervaluing Do. That wasn’t my goal. In fact, I even wrote in Know Be Do, “The purpose of this book is not to undermine the value and necessity of doing for God (works), but it’s to underline the preeminence of living in Him (knowing) and Him in you (being).” Every book, however, is in some way an extreme reaction to a counter concept. And Know Be Do was my manifesto against the Legalism that warped my Christian perspective for many years—and still does to some degree. In fact, it distorted my thinking so much that I failed to connect one more dot—from Do back to Know. Consider Psalm 111:10: “All who follow His instruction have good insight.” Principle: Do what God says, and you’ll get new insights into Him. One time my Dad asked me to do a chore for him. I neglected it. It stifled our relationship until I did it. On the other hand, say my Dad asks me to do something. He helps me. We do it together. It bonds us and fosters more cooperation and love. And to know the Messiah’s love that surpasses knowledge, so you may be filled with all the fullness of God. Now to Him who is able to do above and beyond all that we ask or think according to the power that works in us—to Him be glory in the church and in Christ Jesus to all generations, forever and ever. Amen. Doing what God wants–and empowers—us to do, closes the loop, completes the circuit, keeps the power flowing. As God has enlightened me more and more to this truth, I’ve discovered that ultimately Know Be Do isn’t linear, it’s actually not even cyclical. Know leads to Be and Do. Be leads to Do and Know. 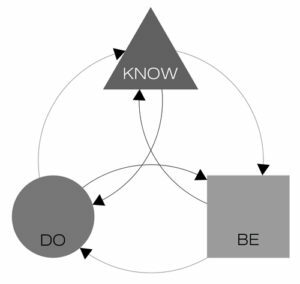 Do leads to Know and Be. It’s all interactive, interconnected, and interdependent. A three-fold cord that is not easily broken (@Ecclesiastes 4:12). Know. Be. Do. Times infinity. Probably not. I’ve been to a summit before, only to discover there’s another even higher summit on the horizon. Only God knows what amazing truths await just over the horizon. Our walk with God has no finish line. And unlike a book, our story with God has no final page. And I can’t wait to read the next chapter. My original, prepublication book cover with circular design. Maybe I had it right the first time?! An award-winning creative writer, Larry Alan Thompson has made a career out of distilling a message down to its simplest form—and making it memorable. Combine this experience with seminary training, a decades-long quest for knowing God, and ministry at one of the largest churches in the world, and you get a breakthrough book like Know Be Do.